In the spring of 1927 John “Jack” Hornby, Edgar Christian and Harold Adlard starved to death in an isolated cabin on the Thelon River. Hornby’s eccentric nature coupled with his extraordinary survival skills in the bush made him a living northern legend. His death by starvation was a surprise to many northerners. Born in 1880 into a wealthy British family Hornby attended the finest of private schools excelling at cricket and rugby and after graduating was expected to either enter the family business – a cotton spinning mill in Cheshire – or perhaps become a diplomat. Instead he chose to travel and in 1904 came to Canada to visit a cousin living in Onoway, a village just a short distance outside of Edmonton. Hornby had a small but adequate income from some investments back in England so he didn’t need to work and since Onoway was, back in 1904, on the edge of the civilized world there was lots of wilderness to explore. In 1908 he met a wealthy British adventurer named Cosmo Melvill who had spent much of his life hunting big game in exotic locations around the world. He convinced John Hornby to accompany him on a muskox and caribou hunting trip to Great Bear Lake (map). Hornby and Melvill did more than just hunting; they also established a small trading post on a bay on the east shore of Great Bear Lake and traded mostly with the Sahtu Dene. During the next three or four years Hornby spent a great deal of time with these Dene learning to live off the land. In 1911 Melvill left the north and that’s when people began to notice that Hornby was showing signs of a deteriorating mental state. When George Mellis Douglas, author of Lands Forlorn, met Hornby in 1911 he described him as being “just like a monkey, chattering and pouring out incoherent conversation”. Others described Hornby as “solitary, resentful, withdrawn and inscrutable”. Casual acquaintances believed Hornby was insane while those that knew him better simply said he didn’t have a firm grip on reality! In 1914 Hornby returned to England, joined the Army and was sent to France to fight in the First World War. In 1917 he was back in Canada and once again headed north. When he passed through Fort Smith he was described by a hotelkeeper as “looking like death”. For several years he lived by himself in a cabin on Great Bear Lake then for a while lived in a hole in the ground on Crystal Island in Artillery Lake, north east of Great Slave Lake. 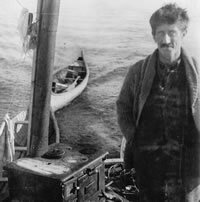 His final undoing came in 1927 when, in the company of his second nephew, Edgar Christian, and an acquaintance, Harold Adelard, Hornby travelled northeast of Great Slave Lake to the Thelon River to spend the winter hunting and trapping. It’s rumoured the only supplies they took along was a bag of flour and a little tea. During the winter, when the caribou became scarce, Jack Hornby’s legendary bush skills failed him and he and his companions starved to death. "John Hornby, the explorer and wild man of the north who, with two companions, starved to death on the Thelon River some time about 1924 or 1925. This snap appears to have been taken about 1924. [On the reverse of the photo:] John Hornby went into the Thelon country with two green Englishmen in 1926, and there they starved to death about 1927. This picture must have been taken in the summer of 1922 or 1923."